Low weight and easy to handle. Battery backup for 10 hours/500 collections. Advanced 32 bit ARM microcontroller based embedded design. 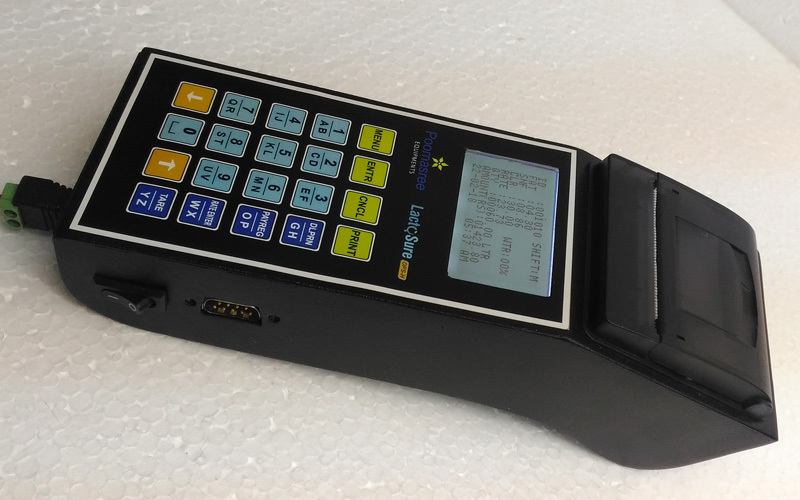 Direct interface with Milk Analyzer and capture weighing data (kg/Ltr. ), percentage of FAT, SNF, Added water and CLR. In-built key board and thermal printer for easy operation & data capture and provision for external key board. More than 5 year data storage capacity. Auto TARE (ZERO) & Manual facility after report printing and data storage automatically. Rate chart format based on TS (Total Solids) & Fat-SN F in Excel Format. Facility for duplicate print out and SMS alert option. High contrast blue backlight 128 X 64 graphical display. Can be interface to various types of weighing scales and milk analyzers. Facility for two decimal points adjustment. RF Id based identification option. Data import and export facility. Following reports can be generated.